The banjar (hamlet) where I live – Kutuh Kaja – is full of colourful characters; tattooed fathers ferrying their helmetless infants around on motorbikes; nenek (grannies) carrying more than their fair load of freshly chopped wood or dried palm leaves from field to home; teenagers either racing down Tirta Tawar (Kutuh’s main road) or a pair of them, riding next to each other, a mere hairbreadth distance away, chatting and laughing the whole way. The dogs, naturally, take center stage whenever it suits them to nap in the middle of the road, genetically reassured that drivers will swerve to avoid them. 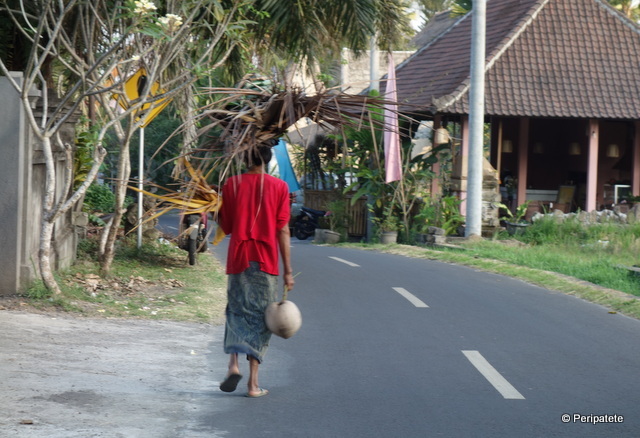 The bapaks (elderly men) of the village, shorter in stature than most, bent over from years of working the sawah (rice fields), limber along, weather-worn sarongs tied tightly around their sagging flesh. As usual, I walk. A lot. 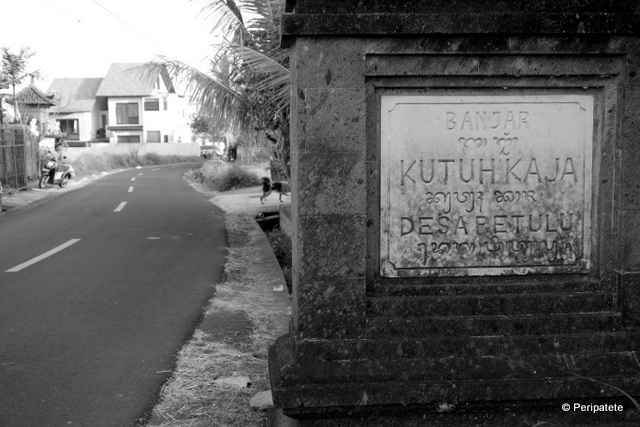 Up and down this Kutuh road. The men sitting on the roadside, patting their roosters, might feel obliged to cackle en masse, the mere mention of the word tamu a ‘reassurance’ that they are, quite naturally, talking about me. I pass without a sideways glance. I nod my head at the laundry guy, the ibu selling snacks in her tiny stall, the teenage girls giggling as they wave and smile “hello” – taken aback that I can engage with them in simple banter… in bahasa. Once in awhile I’m stopped in my tracks by a sight that’s quite extraordinary, rather unexpected in these parts. 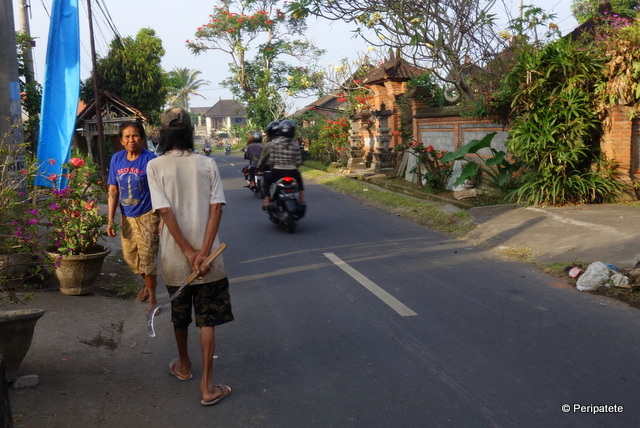 It might be an exotic foreign vehicle that some Balinese landlord has snagged pursuant to his sudden and newly found wealth; or it might be a posse of aging, Hells’ Angels-like Balinese motorbike riders speeding noisily up the road, fully decked out in black leather – tell me, don’t you sweat to death under this blazing midday sun? Recently, I happened to be sauntering down the road behind a farmer carrying a scythe in the traditional style – held behind his back. Nothing else caught my attention, so I glanced around as we continued to walk. Then he stopped to speak with a neighbour. The neighbour carried on and the farmer turned towards me. And this is what I saw. Really? Quebec Yacht Club? Does that even exist? Indeed it does! 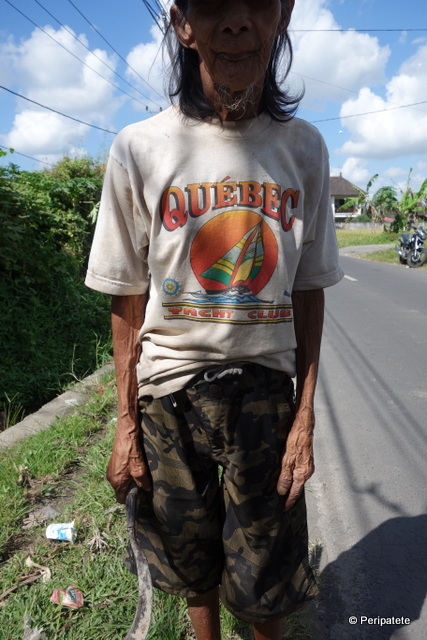 Here was an otherwise nondescript long-haired Balinese farmer with burnished and finely crease-lined skin, so inexplicably dressed in a t-shirt most likely manufactured in China, delivered to Canada, ultimately ending up in a souvenir shop in the capital city’s old quarter. I could not have been more surprised had I been traveling in Antarctica and spotted a woman wearing a sarong. My mind reeled with imaginary scenarios and soap-opera-like possibilities. 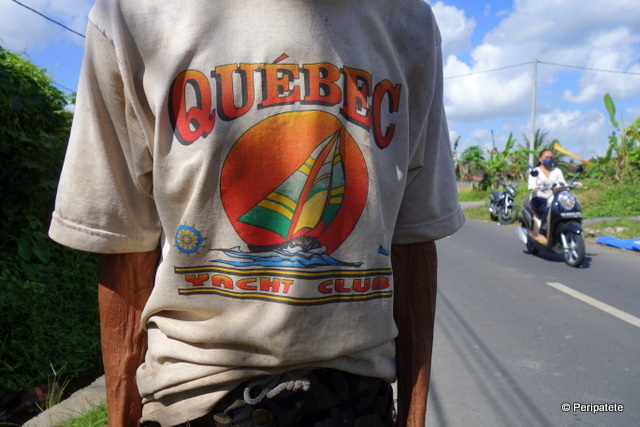 Maybe a young tourist visiting Bali from Denmark, who had once sailed from Quebec City’s marina and purchased this t-shirt as a souvenir, left it behind in a guesthouse, and the owner handed it to this.. say, Pak Wayan? Or, could be that a French traveler whose French-Canadian girlfriend had gifted him the shirt, split up with said copine, passed it on to the Balinese teenager that he wooed for awhile, who then cried when Jean left her behind, and in a momentary grief-stricken state, handed it over to her bapak? I approached the bapak excitedly and, pointing to his shirt, used animated hand gestures to explain that I was from a neigbouring city. Bapak might or might not have understood. But bapak could not have cared less. An old-school Balinese through and through, he just wanted to go on his merry way, get to his field so he could cut grass for his cows. Oh, been there and done that. Walking down towards the Kremlin here I saw a guy wearing a Seattle Seahawks tee shirt. I had to cross the road and greatly pleased that I did. The guy was from Seattle and was in Kazan as a reporter. Always good to have these experiences even if they don’t meet our expectations don’t ya think?